The most popular in the Fx large series line-up, the Fx275 Qtv is made for excavators in the 21 to 33 ton range, and is a brute among hammers. 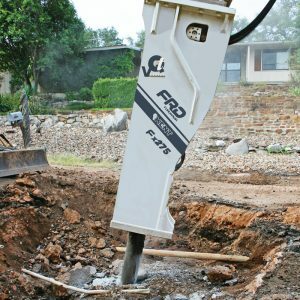 Built to take punishment, the Fx275 Qtv hammer can handle road removal, reduction of bridge pylons, foundation demolition, and the extremes of quarry applications. Incorporating the latest in design technology, it also offers less maintenance and downtime and smoother operation. The new square mono-block body design eliminates thru-bolts increasing durability and reducing maintenance and failure due to broken bolts. 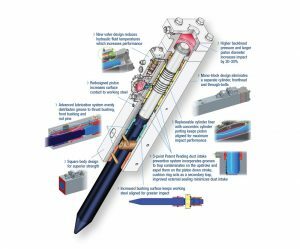 An increased hydraulic flow range allows the hammer to be used on a wider range of carriers for greater inventory utilization. Operators appreciate performance features that include a new valve design to reduce hydraulic fluid temperatures. A redesigned piston enhances surface contact to working steel, while a larger bushing surface keeps it aligned for greater impact. A replaceable cylinder liner increases tool life and reduces time-consuming maintenance. A higher back head pressure and large piston diameter increase the impact energy by up to 20-30% over previous models. The one-piece enclosure reduces noise levels making it a perfect choice for reduced noise applications. All FRD USA hammers come complete with our exclusive Pro-Pak for ease of installation. The Pro-Pak includes hose whips, mounting hardware, standard working steel and tool kit with operating manual at no additional charge. Impact energy class 5,250 ft. lbs.